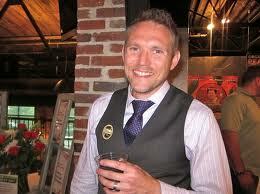 Denver’s Bryan Dayton to Compete in the First Ever Global Bartender Summit in London. On Monday, Sept. 12, 46 of the top mixologists from the United States and Canada, each of them having already proven themselves as their hometown’s mixology master, showcased their talents in Las Vegas as part of the USBG Bartender Summit sponsored by BOMBAY SAPPHIRE(R) and GQ Magazine. After two days of meticulous cocktail-making, the USBG announced Denver’s Bryan Dayton as the nation’s “Most Inspired Bartender.” Dayton, styled by chic British design label Ted Baker London, will be featured both inside and on a special edition cover of GQ Magazine’s December 2011 Men of the Year issue alongside his signature cocktail, the East Aspen Heights. Now in its fifth year, the “Most Inspired Bartender” program traveled to more than 40 U.S. cities and four Canadian cities to attract the highest caliber of talent to attend the Las Vegas Bartender Summit. Not only was title of nation’s “Most Inspired Bartender” at stake, but the search now expands overseas to identify the first internationally recognized leader in bartending. This newly appointed global recognition program has encouraged mixologists everywhere to push the boundaries of a rapidly evolving cocktail culture to its greatest potential. The winning mixologist from the Las Vegas Bartender Summit have a once in a lifetime shot at representing their country during the Global Bartender Summit in London this fall — a clear indication of how the “Most Inspired Bartender” search has become a pillar in the industry. Having increased from 240 entries and 16 cities at its inception to 1,200 bartenders and more than 40 cities today, the program is proud to continue shining a spotlight on undiscovered talent around the world. The summit began in Las Vegas on Sunday, Sept. 11, when all 46 bartenders prepared their inspired cocktails for an elite panel of USBG representatives. The following night, 10 selected mixologists presented cocktails to “The Modern Mixologist” Tony Abou-Ganim, respected spirits writer Camper English, USBG representative Francesco Lafranconi and the evening’s host, top celebrity chef Tyler Florence. For the first time in the history of the USBG “Most Inspired Bartender” search, the final event was held in a high-energy Iron Chef-style format, with the introduction of a very special secret ingredient — the newly launched BOMBAY SAPPHIRE East(R) gin. Infused with crisp Thai lemongrass and spicy Vietnamese black peppercorn, BOMBAY SAPPHIRE East challenged the 10 mixologists to explore new flavors as they created cocktails that represented their home cities. Dayton was in venerable company at the USBG Bartender Summit, working alongside runner-up, Scott Mayer of Miami, who created The Bitter Developer using BOMBAY SAPPHIRE East, his very own bitters recipe and Cocchi Americano. San Francisco’s Brandon Clements, the 2nd runner-up, also used a unique combination of ingredients, including BOMBAY SAPPHIRE East, BENEDICTINE(R) Liqueur and sage leaves in his Eastern Sage cocktail. Along with Dayton, Mayer and Clements will also be outfitted by Ted Baker London for their close-up in GQ Magazine’s December 2011 Men of the Year issue. In 2011, Dayton and his East Aspen Heights cocktail stand as a classic example of the imagination, passion and ingenuity necessary to be named the nation’s “Most Inspired Bartender.” In a few short months, Dayton will proudly represent the United States in the 2011 Global Bartender Summit in London, where for the first time, the “World’s Most Inspired Bartender” will be named. Muddle two blackberries in a mixing glass. Add the rest of the ingredients. Add ice and shake. Serve in an old-fashioned glass. Garnish with a sage leaf-wrapped blackberry. *Infused simple syrup preparation: Chop sage, muddle juniper berries and add fennel seed to simple syrup. Simmer over heat for 10 minutes and then strain. Stir all ingredients in a mixing glass with ice. Serve in a chilled coupe glass. Garnish with a grapefruit twist. Let sit 10 minutes and strain. Stir and strain into cocktail glass. Garnish with orange twist, grapefruit twist and one leaf of sage. The United States Bartenders’ Guild is an organization of beverage service professionals dedicated to the continued refinement of our craft. Such refinement is achieved through advanced product education; original hand crafted cocktail competitions; and aggressive involvement with other professionals in the beverage industry throughout the country and internationally. It is our intention, desire and main focus to become the most skilled, knowledgeable and professional group of bartenders in the industry. Above all, the United States Bartenders’ Guild supports and promotes well-informed, responsible consumption of alcoholic beverages. BOMBAY SAPPHIRE(R) is the fastest growing premium gin in the world and world’s number one premium gin by value. BOMBAY SAPPHIRE is created with a unique combination of ten hand-selected botanicals, sourced from around the globe. The brand’s global essence and signature vapor infusion process impart a refined and perfectly balanced taste, versatile enough for both classic cocktails and exotic recipes. Infused with imagination, BOMBAY SAPPHIRE is a symbol of the exploration of worldly and sophisticated lifestyles. For more information, please explore www.bombaysapphire.com . BE BRILLIANT AND INSPIRED. DRINK RESPONSIBLY! (C)2011 BOMBAY SAPPHIRE AND SAPPHIRE ARE REGISTERED TRADEMARKS. SOURCE: The Bombay Spirits Company U.S.A.